Have you seen Pepsi’s Eco Challenge website? It is one of the most robust recycling websites I have seen. The Pepsi Eco Challenge website tells the entire story of what Pepsi is doing to reach their environmental goals – from their improving their trucks and buildings to helping college students recycle with the new URecycle program. To navigate to the Cells for Cells section of Pepsi’s Eco Challenge, go to www.pepsiecochallenge.com. Then, click on the bottom right hand on the PACKAGING link and then, after that page loads, click again on the bottom right hand on the PARTNERSHIP link. Thank you, Pepsi, for your leadership. Thank you for using our resources efficiently. 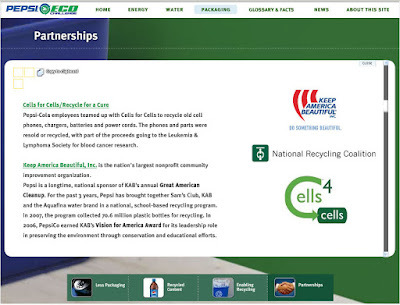 And, THANK YOU for allowing Cells for Cells to be a part of Pepsi’s Eco Challenge. By the way, do you remember this classic Pepsi commercial with the Godfather Girl? World’s Smallest Cell Phone: Could it be the future of Communication? You have got to check this out: It is the world’s smallest cell phone. This is the link to Modu Mobile’s website. The phone is as small as a matchbox or a stereo remote control – and it is so versatile. It appears to function as the “brains” that powers your other electronics: car/home stereo, mobile phone, gps device, handheld games, etc. The coolness factor is off the charts. I can’t wait to “recycle” our first one. If you happen to come across one and can “donate” it, we would love to play with it.